Do the dads in your life adore an open flame, some good tools and a great piece of meat? If so, then we've got some great shopping ideas for Father's Day this year. Whether he's into charcoal or gas, chicken or beef or whatever, these grilling tools and gadgets are fabulous for all the grill-loving guys in your life. Whether he loves smoked flavors or craves a good glaze, these ideas are sure to make him smile big this Father's Day. Whether it's the mechanics of cooking or the details of how to cook things, these gadgets are fun and interesting. Remember that Tim Allen show where he grunted a lot? Well, when you think of the dad in your life and steak, does that sound come to mind? If so, give dad an extra special gift for making his steaks totally unique. The Monogrammed Steak Brand from Williams-Sonoma can be ordered with one, two or three initials on it. All he has to do is heat it up and brand the steak ... Talk about marking your territory! Have you ever seen a good steak being cooked? The flare-ups can be huge. But a new product aims to eliminate the flare ups (and the charring, drying out, etc). Grill Grates sit on the surface of grills and captures most of the grease as it drips from the meal, letting it flavor and moisten the meal as it cooks. If the dad in your life loves gadget, this is a unique new one to try. Does he grumble and moan when he has to grill a bunch or burgers or steaks to a certain doneness? Make it easier on him! Grill Charms are the perfect solution. The small button-shaped ornaments are pushed into meat so that the grill master can easily ID which piece is well done, which one is medium-rare and so on. It's a cool idea and bound to make his life easier. Potato Grill Rack: Cooking potatoes on the grill can take forever. But with this handy accessory, the potato can cook from the inside out and outside in. Steven Raichlen Double-V Smoker Box: Love the smokey flavor of smoked foods? 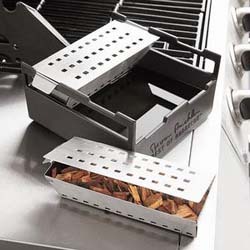 This smoker box lets you impart that on whatever you want using your regular grill. How cool is that? Sauce Bucket and Mop Set: Let him slather that glaze on with this awesome sauce bucket and mop (yes, MOP!) set. You can almost her the sloshing as you dip the mop in the sauce and slap it onto the meat ... sweeeeet!